Modern data collection technologies are creating enormous data resources that are underutilized in science education and research. We often present graphs showing exponential growth of one kind of database or another, but how often do we stop to ask the questions: how many people are using these data? And how are they using it? Without efforts toward improving general use, data resources will not be valued, which can negatively impact the value of future data collection endeavors. New approaches are required to increase the overall understanding of how the data can be utilized. The approaches also need to be combined with user-friendly tools and content that demonstrates specific applications with interesting stories. Digital World Biology is addressing this opportunity with its on-line courses and mobile apps. 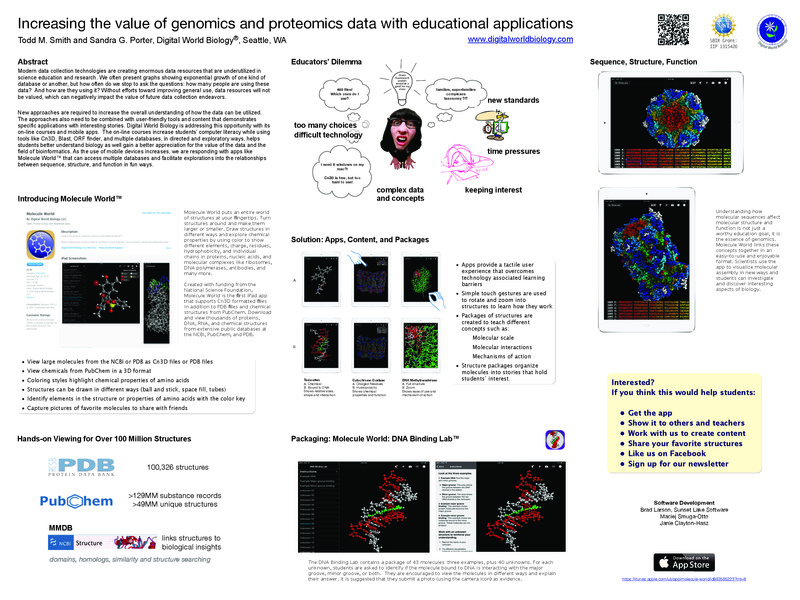 The on-line courses increase students’ computer literacy while using tools like Cn3D, Blast, ORF finder, and multiple databases, in directed and exploratory ways, helps students better understand biology as well gain a better appreciation for the value of the data and the field of bioinformatics. As the use of mobile devices increases, we are responding with apps like Molecule WorldTM that can access multiple databases and facilitate explorations into the relationships between sequence, structure, and function in fun ways.